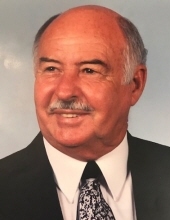 William Gordon Acuff, age 82, formerly of Knoxville passed away Nov. 5, 2018 at Alexian Village in Signal Mountain, TN. He peacefully passed with his family by his side. Mr. Acuff was a member of Washburn Baptist Church. He was a graduate of Carson-Newman University and earned his Masters at The University of Tennessee. He was retired from the East Tennessee Human Resource Agency that he founded and served for 35 years. He had a great energy, compassion, and enthusiasm for helping others in need in his professional and personal life. Gordon was a loving, caring man with a great sense of humor. He loved to tell stories of growing up in his beloved hometown of Washburn, TN. He was an avid Tennessee Vols fan. He is survived by son, Gregg Acuff and his wife Patsy, and granddaughters Hannah and Ashley Acuff of Signal Mountain; brothers, Philip Acuff of Washburn, and Norman Acuff of Rutledge; special friend, Mary McDermott, her daughter Leslie McDermott, and grandchildren, Riley and Carly Gelb all of Oak Ridge, several nieces and nephews and so many great friends. In lieu of flowers, the family is asking for memorial contributions to be made to the Washburn Cemetery Association P.O. Box 224 Washburn, TN 37888. A Celebration of Life Service will be held at the Milestones Event Center next door to the Click Funeral Home Farragut Chapel on Friday, Nov. 9, 2018 from 12 pm until 2 pm. Followed by a special graveside gathering at the Washburn Cemetery. Click Funeral Home Farragut Chapel, 11915 Kingston Pike is serving the Acuff family. To send flowers or a remembrance gift to the family of William Gordon Acuff, please visit our Tribute Store. "Email Address" would like to share the life celebration of William Gordon Acuff. Click on the "link" to go to share a favorite memory or leave a condolence message for the family.